Presiding over the Monaragala District Sri Lanka Freedom Party Convention held Saturday (23rd) at the Library Auditorium in Monaragala, the President declared that he is meticulously discharging his obligations on behalf of the country and the Sri Lanka Freedom Party. He has said that the members of the SLFP are bound by duty to achieve victory for the country and the party and therefore hey should extend their support needed for the future activities of the government. The President also warned members of Sri Lanka Freedom Party (SLFP), the political party he leads not to act towards disbanding the Sri Lanka Freedom Party. The President recalling that he was imprisoned three times during the administration of former president JR Jayawardena for staging a battle during against the then regime on behalf of the SLFP, the President said he wishes to challenge that no one other than him had made a firm dedication to the party. President Sirisena noted that it was former president Mahinda Rajapaksa who first formed an alliance between the United National Party (UNP) and the SLFP in 2006. He said that the SLFP members constitutionally appointed him as the head of the Party. If so he called on the party activists to extend the support needed for future activities and enable him to build a new country. 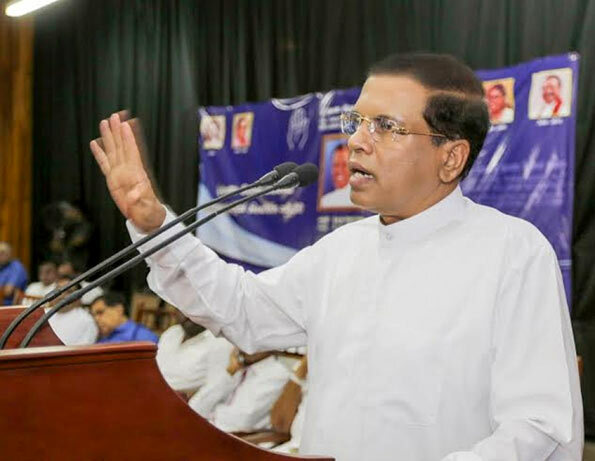 President Maithripala Sirisena also requested those gathered not to be flustered by false propaganda aimed at spurring discord within the party. Opposition Leader Nimal Siripala de Silva, SLFP General Secretary Anura Priyadarshana Yapa, Parliamentarians Jagath Pushpakumara, Sumeda G Jayasena, Vijith Vijayamuni de Zoysa, Ministers and other Provincial and Regional council members representing Monaragala District were also present at the event. There are too many agendas in the political sphere. It is said Mahinda Rajapaksa formed an alliance with the UNP in 2006. So what? If backbone-less people want to play follow the leader, so be it. But the amude-wearing voter has the last say in any matter. As long voting is not rigged (as it was on 8 Jan 2015), the voter will speak when the time arrives. A SLFP-UNP alliance will be disastrous to the body politic of this country. If such an alliance occurs, the JHU will be the winner and possibly, be able to form a government on its own at the forthcoming hustings. Is it that bad now your hon-our? Did that threat of disciplinary action of suspending membership if people attend MR’s meeting backfired badly now to appeal? It is a joke to talk about professional intellectuals in the UNP when the leader is a joker has to be rescued by CBK upon the questioning of Indian media on his remarks and silly things like Alimankada- Pamankada under his belt. It is a party led by a 10 year loser who the membership could not get rid of, after election defeats and did not resign as the party leaders in other civilised countries do after election losses . Became the PM of the country as an appointment for payment for UNP votes in the presidential election 2015, have no public mandate to govern.